Check out this biblical scene as re-told by The New Yorker. The cartoonist reminds us that there are not really any quick fixes in the spiritual life. And our best times with God are not hurried, not like a lunch order to go… but like a carefully prepared meal, where we leisurely converse and savor every bite. 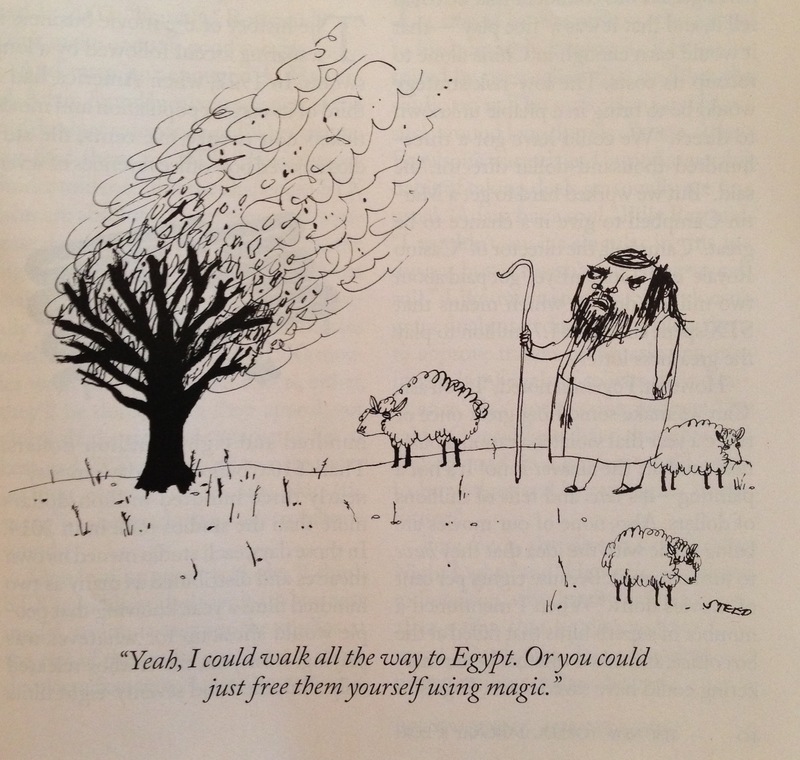 Ironically (regarding this cartoon), God did free the Israelites from Egypt using a little bit of magic—or miracles, at least. But the most salient feature of God’s delivering his people from slavery was his presence among them. He tabernacled with them, literally. God was a God seeking a people among whom he could dwell, and make his home. The spiritual habit in focus with this post is that of meditation. Christian meditation is a way to silently open ourselves up to the working of God in us. It’s a closer sense of communion—union, even—with God. Lectio divina is an ancient way of reading Scripture that goes back to at least the Middle Ages. It means “divine reading” or “holy reading.” It has traditionally been used by Benedictine monks, but more recently has become popular with Protestant Christians, as well. “Lectio,” as it is called, can span 20 minutes or 2 hours. Through this sort of contemplative, prayerful reading of Scripture, we open our hearts and ears to the God who speaks to us through his Word. Saint Benedict spoke of reading the Bible with “the ears of our heart.” We can become like the disciples on the road to Emmaus, where Jesus is not just written Word, but the living Word. The idea is that Scripture and time with God would not just inform us, but form us. Lectio divina is not meant to be a formula. The important thing is not so much to complete the following steps as such, but to enter in to communion with God. We want to open up a space where the living God—who breathes his Holy Spirit on us—can change and shape us. This process is meant to help us do that. One writer talks about it as “feasting on the Word,” and says you first take a bite, then chew on it, then savor its essence, and finally digest it and fully take it in to your body. Traditionally there are four steps or movements in lectio divina—I like five, actually, since I find that starting with deliberate preparation can be helpful for focusing a wandering mind. Here we simply prepare ourselves for an encounter with God. This “know that God is God” is what sets Christian meditation apart from just “meditation.” We are not emptying ourselves for the sake of emptying ourselves and achieving some kind of zen state—instead, we are casting aside our distractions and preoccupations so that we can enter into fuller communion with God. Having readied yourself, the first thing to do is to read a passage of Scripture, as slowly as you can. You could even use multiple translations if you find that helpful. But don’t get too hung up on logistics. Picking a shorter passage is best. Psalms are especially good as we do this type of meditative reading, since they are already reflective prayers. Then we reflect on the passage, and give it some time to sink in. Through meditation or reflection, we let God speak to us and see what one word or phrase particularly jumps out at us. Then we meditate on that phrase for at least a couple of minutes, repeating it to ourselves over and over and asking God to come be with us and speak to us through that word. Finally, there is rest. In the end we spend more time in silence, thanking God for his Word. We simply rest in God’s presence, receiving all that he desires to give us of Himself. We surrender ourselves, too, to the will of our loving God. After moments of contemplation, you might even wish to make for yourself some kind of reminder to keep with you—you could write or draw or paint or create a short tune to sing… however you can best capture what you’ve experienced of God, to carry with you as your day progresses. You begin with silent preparation—the sort of re-orientation you need to begin lectio, and then you can read that passage before each of the movements. If you want to try this right now, below is a summary of what’s above, that you could use to work through the movements with this text. Rest quietly in the presence of our loving God. I love this! Thanks for posting about an ancient practice that has been experiencing a bit of a rebirth. You’ve made it much more approachable and given us a way to engage more meaningfully than we might have had. Hi, Jen! Really glad you found this helpful and approachable.